HopeSeeds focuses on positive messaging "planting a seed of change" in an attempt to help with an anti-bullying message, but focusing on being kind and considerate to one another. We love this idea of creating positive change at a younger age in the hope that we can educate and teach children to be kinder and hopefully eliminate some of the bullying that happens once they move into their teenage years and head into high school. We know that bullying in New Zealand is a big issue and are passionate about wanting to create change with our younger humans. By purchasing these seeds you will provide vital food for monarch's, but you will also be supporting the Monarch Society of New Zealand as they will receive $0.20 cents from each sale. By supporting the Trust, it will allow them to carry out various projects and continue to educate children about butterflies and the environment, whilst teaching nurturing and empathy skills. Youthline will also be receiving a portion of each sale, $0.30 cents from each packet sold which will support us in the work we are doing to help change the lives of young people around New Zealand. S​eeds can be purchased as a fundraiser - providing essential food for caterpillars for $1.80 (exc GST) so a profit of $0.93 cents can be made per packet for you as a fundraiser and the great thing is that Youthline will receive $0.30 cents as well so it's a win-win fundraiser. 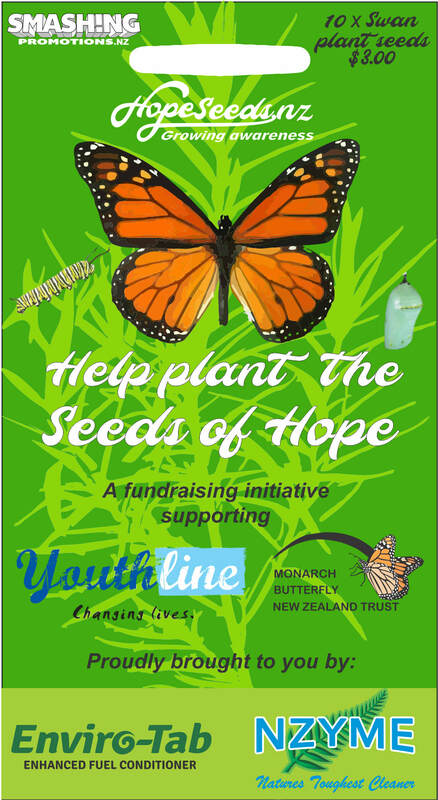 If you do not want to fundraise, but would like to buy some seeds to do these school holidays and to support Youthline, you can purchase below. Thank you for your support.